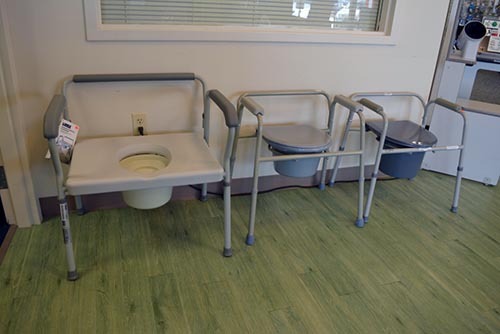 They come in two styles: 3-1 commode can be used next to the bed, or used in the bathroom for over-the-toilet as an elevated seat with safety frame and will hold up to 300 pounds. Also comes in a wide, heavy-duty, holding up to 400 pounds with a wide seat. Both have adjustable legs to raise and lower. We sell commode liners for the pail to make clean up easier and replacement pails and splash guards.